Oy Vey, Zaidy’s Makes a Good Turkey Sandwich! I’ve lived in Denver for three years and I have not taken their advice and gone to Zaidy’s. I was starting to feel like a real nebbish. Today I finally got my tuches over to Zaidy’s to give their Turkey Sandwich a try. 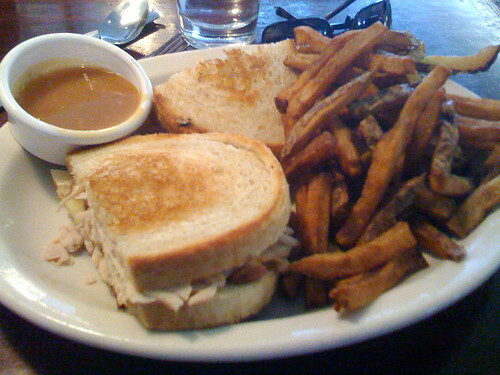 I ordered the Smoked Turkey and Apple Sandwich and Ay-Yay-Yay this is a great Turkey Sandwich. To be honest, I could have schtupped this sandwich. Real Turkey, bacon, apples and a really thick honey mustard sauce – I was totally ferdrayt. Next time you’re in Denver and looking for a place to drop some gelt on a Turkey Sandwich, go to Zaidy’s. For a translation on some of these phrases, click here. Posted on March 24, 2009 by NealPosted in Turkey Sandwiches in DenverTagged apple, Bacon, colorado, denver, turkey sandwich, zaidy's. Best turkey sandwich blog entry ever.